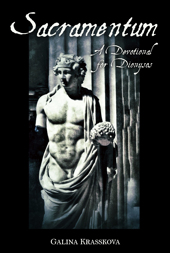 Now available – Sacramentum: A Devotional for Dionysos. A pocket-sized book containing prayers, poems and essays. This entry was posted in Uncategorized and tagged Bacchus, book, devotional, Dionysian, Dionysos, Dionysus, essays, god, Greek, Hellenic, pocket, poetry, polytheism, prayers. Bookmark the permalink.